Play Triple Dragons Slot Online with 500 Free Spins! 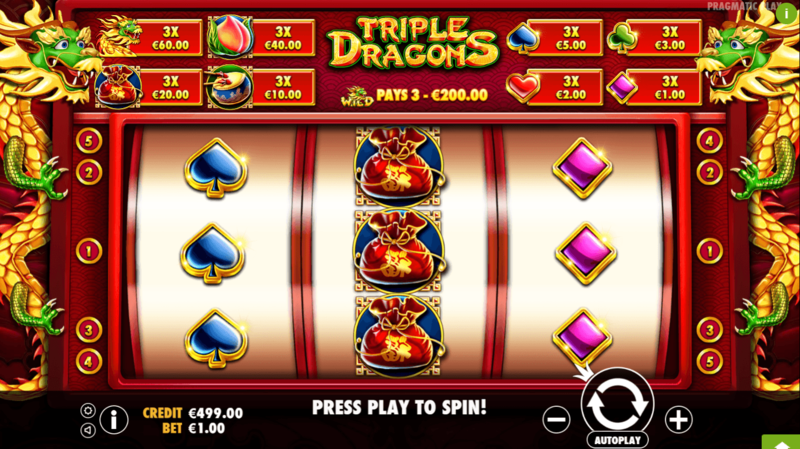 Triple Dragons is a 3 reels, 25 paylines online slot game by Pragmatic Play. Triple Dragons has Wild, and Wild Respin features and an RTP of 96.51%. If you want to give Triple Dragons a try, do it right here at Rose Slots where we also play host to more than 500 great UK online slots including Fluffy Favourites, Starburst, Rainbow Riches and Great Rhino. The traditional meets the Oriental in this Pragmatic Play slot, which takes its theming cues from Chinese culture and blends them into a good-looking but simple creation, belonging firmly to the finest traditions of online slot games. The way the reels appear to curve on the 3x3 layout is designed to make you think of physical slot machines from slot gaming' distant past, bearing a slight resemblance to a one-armed bandit. One-armed bandits never looked this good, though. We’ve come to expect colorful, warm and bold visuals from Pragmatic Play, and they’ve applied their design skill to excellent effect once again here. The background and the framing of the reels are all colored a rich Oriental red. Above the reels are the slot’s logo, and a reminder of the symbols and their individual values - just as they would be if you were stood in front of a slot machine in a bar or a casino. If you’re a fan of online slots with a classic style, you’ve come to the right place. We have plenty of them at Rose Slots, and Triple Dragons is yet another strong entry into the field. Although the layout and the animation style is simple, there’s an authentic Chinese soundtrack to help get you into the mood. Oriental themes turn up again and again in online slots because - as is the case with Irish-themed lots - there are multiple symbols and customs embedded into the culture which are typically associated with luck. Slot players like to feel lucky when they spin, which makes the genre a popular one. The four playing card suits (hearts, diamonds, clubs, and spades) account for the least valuable of the symbols that appear on the reels. Above them is a drum, a bag of gold dust, a lucky lotus flower and a golden dragon. The slot is called ‘Triple Dragons' because landing three of the dragons on the same spin will pay you the top prize available from the base game, which is 60x your line bet. The dragon serves as more than just the top-value symbol though - if enough of them turn up at the same time, they become wild. In the process of doing so, they’ll also trigger the one bonus feature that Triple Dragons has to offer. As there are no scatters or other special symbols in this slot, a wild dragon will replace any other symbol to create a winning combination. If you've ever played a Pragmatic Play slot before, you'd know this was one of theirs on sight. They have a very strong design ethic that's visible in all of their slots - especially their Orientally themed ones, of which they have several. It's good for any brand to have a strong visual identity, and Pragmatic Play has theirs nailed. They're also known for the simplicity of their slots; while other developers are pushing hard to include more extra features and bonuses in their products, Pragmatic Play is working hard to ensure that those who prefer the traditional way of playing slots don't end up feeling left behind. The developer is based in Malta and has been operating since 2007. They're prolific in their output, releasing at least one slot per month and frequently issuing more than that. At the time of writing they're getting close to 150 online slots; within the next couple of years, we wouldn't be surprised to see them hit two hundred or more. Of everything they've created to date, the one most popular with UK online slots players has been Wolf Gold slot, which won several ‘Slot of the Year' awards for 2018. They've already published Mustang Gold slot game in early 2019 to follow it up, and so it looks like they have more accolades in their future. In the here and now, you can play Pragmatic Play's slots in 22 different languages, and the company has expanded beyond their Maltese office to take on premises in the United Kingdom, Gibraltar, Romania, India, Ukraine, and the Philippines. Such a vast expansion is consistent with their stated aim of becoming - and remaining - the fastest growing digital casino company in the world. At their current rate of progress, soon it won't be a question of whether they're the fastest growing - it will be a question of whether they've become the very largest overall. You don’t come to play classically-themed online slots in the hope or expectation that there will be multiple bonus features to play for - that isn’t the point of them. Indeed, we have many traditional online slots here at Rose Slots which have no bonus features whatsoever. Triple Dragons isn’t quite so featureless - it has one extra wrinkle to offer to players, and it’s all about finding as many of the golden dragons as possible. The dragon has a habit of stacking when it shows up on the reels. Sometimes it will come as a stack of three and therefore fill a reel completely. When that happens, the dragons become wild, and the slot starts its Wild Respin feature. The other reels will then spin again and again until a payline is created. During the attempt to find you that win, it’s possible the slot may create another full reel of dragons. That will also become wild, and the process will continue. Any winning combination created with two reels full of dragons is bound to be of significant value, but if luck is truly on your side and you can fill every space on the reels with dragons, your prize will be 1000x your stake. Triple Dragons is easy to understand, easy to play and well presented. When it comes to a traditional slot, that’s all you want to see.